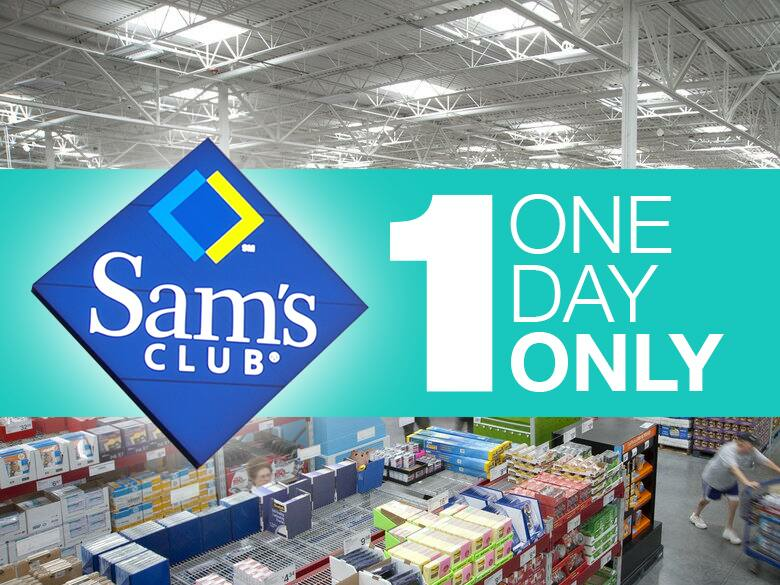 Summer isn't officially over until Sept. 22, but Sam's Club is giving us a taste of autumn with its upcoming one-day-only Fall Preview Event. Just like with every other sale, this promotion has its fair share of great and not-so-great offers. 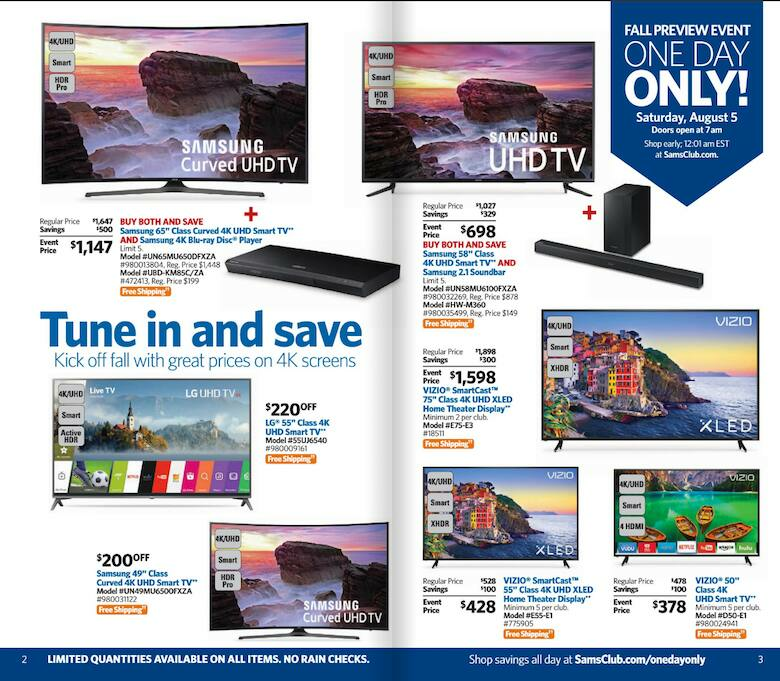 That's why we've reviewed the 20-page ad scan to help you decipher which deals are worth bumping to the top of your list. The one-day sale will take place on Saturday, August 5, 2017 with doors opening at 7 a.m. for all you early birds out there — but night owls can shop the deals even earlier starting at 12:01 a.m. ET online. Limited quantities are available on all of the store's featured products, so you're wise to snag any items you want sooner rather than later. Check out our Sam's Club shopping tips for more info, or browse the store's August savings via its monthly coupon book. Despite these decent prices on 4K TVs, we've seen the advertised $598 VIZIO SmartCast 60” Class 4K Ultra HD Home Theater Display w/ Chromecast built-in sell for just $548 at Sam's Club within the last year. $298 Liftboard Single Motor Electric Skateboard (reg. $398). At $100 off, this one-day-only deal beats every other retailer's price. $59.87 HP Envy 4524 All-in-One Printer with $20 HP Instant Ink Prepaid Card (reg. $99.87). This is the lowest price we've seen on this particular model, and you're getting a $20 HP prepaid ink card with it. As Slickdealer abadan points out, Best Buy is currently offering impressive discounts on the Galaxy S8 and S8+ (as much as $400 off when you buy and activate the phone with a monthly installment plan through Sprint). Depending on your preferred carrier, you may or may not want to shop elsewhere. $199.98 A-iPower Portable Gas Powered Generator (reg. $299.98). The store also has a "Shocking Value" price of $148.64 on the Sportsman 800 / 1,000 Watt Inverter Generator. Even better, these online specials all ship free of charge. Pass on the $79.98 Haier 2.7 cu. ft. Compact Refrigerator (reg. $99.98) -- Walmart has this same model for $79. Also, save your money and skip the free $200 Sam's Club gift card with the purchase of a Samsung 75" Class 4K UHD Smart TV. The store has this model priced at $3,078 (much higher than at other competitors). 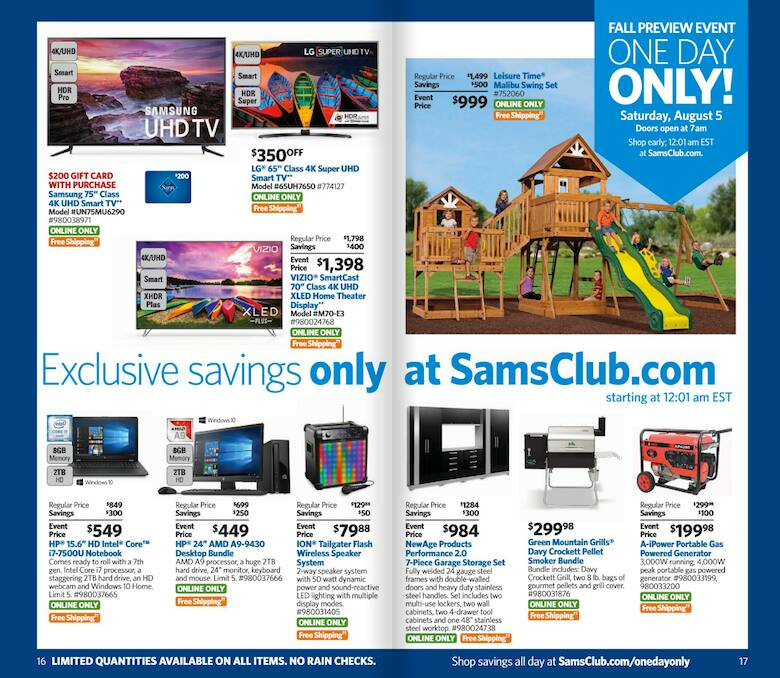 Finally, Sam's Club is advertising a three-day promotion that overlaps with its Fall Preview Event in which you can score $40 off your purchase of $100 or more when you open up a Sam's Club consumer credit card account and make your qualifying purchase anytime between Aug. 4 and Aug. 6. The funny thing is that the store's already running a similar (but better) promotion where new cardholders can receive a $45 statement credit on a $100 minimum purchase now through Aug. 31. These offers can't be combined, either (and yes, we definitely checked). Ultimately, this is a great incentive to save even more during the one-day sale, but don't rush into opening up a new credit card account just based on this limited-time promotion. Do you plan on shopping the store's Fall Preview Event? Let us know which deals are catching your eye in the comments section below!